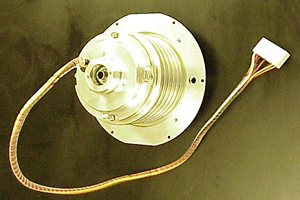 August 21, 2009, Dayton, Ohio -- CIRCOR Aerospace, Inc. /Motor Technology, a CIRCOR International company (NYSE: CIR), has completed the design, manufacturing and testing of its first brushless DC fractional HP motor. Motor Technology’s (MTI) brushless motor design features 6 pole - 18 slot rotor and stator assembly, integral hall effect sensors for feedback to controller, and 3 phase Wye configuration winding. MTI’s brushless motor has advantages over conventional brushed motors and are designed for improved EMI characteristics (eliminating sparking typical of brushed motors with commutators), optimal efficiencies, minimal vibration, minimal mechanical noise, smooth acceleration and continuous duty. CIRCOR Aerospace/MTI is exploring opportunities for this technology, including EM Actuators, High Performance Blowers, and Motor Operated Valves for use on aircraft and military ground vehicles. Motor Technology is a CIRCOR Aerospace company located in Dayton, OH and designs and manufactures precision fractional horsepower DC motors, gearmotors and brake motors. While generally servicing the aerospace/defense and medical fields, Motor Technology products can be found in numerous other applications, including the petroleum, computer, industrial, instrumentation, robotics, servo, and space industries.